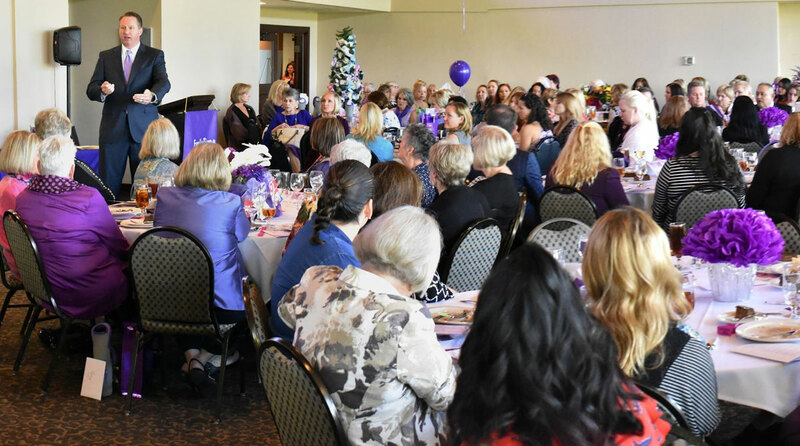 FamilyTime’s annual Purple Ribbon Lunch recognizes domestic violence awareness month (October) and women of achievement 1990 – 2017. Hosted at Walden on Lake Houston’s Golf & Country Club, this year’s luncheon was a great success thanks to sponsors and friends! Judge Lincoln Goodwin shared an especially moving and personal story showing how domestic violence affects us all but can—and often is—overcame with a strong support system. FamilyTime Crisis and Counseling Center is an exceptionally worthy charitable organization that provides the support system services people in crisis need. Currently, land for a new shelter has been acquired and a capital campaign is underway. The goal is to increase beds from 33 to 75, square feet from 10,00 to 30,000+, acreage from < 1 to 3-5 acres with an annual budget increase needed from 1.82M to 2.5M. Many of us at both Framestead and Truwin Enterprises has been involved with FamilyTime for years and have seen first hand how together we can make a difference in our community. Over the years, many success stories have been experienced and told, giving those in crisis hope. We encourage you to help in any way you can by going to https://familytimeccc.org/ and clicking on the donations/volunteer tab. If you are in need, please contact 24-Hour Crisis Helpline & Emergency Shelter 24-Hours a day (281) 446-2615.